And also extends some thoughts that I’ve had, particularly since Austin Kocher’s presentation on the spaces inhabited by interpreters at this year’s AAG. Austin’s paper was great – but also worrying. In it, he gave an outline of the level, and type of cultural theory (for that, don’t read Cultural Theory à la Edward T. Hall – although that too, read cultural theory – i.e. knowledge about culture) that interpreter trainees are formally exposed to during training. His conclusion, and that of those listening (well, me at least!) – that although Deaf cultural theory is steaming ahead into the realms of performativity, positionality, reflexivity, hybridity, postcoloniality and so on, interpreters may well be starting their active service with a cultural toolbox that is ten years out of date. To clear up her easier question first – yes, I am interested in the “larger social questions any time a technology has overtaken a craft-based skill set”. Like MB, I am quite a fan of the ‘slow’ life (in fact, we’ve been talking about this out of band) and would rather imagine a world that is less ‘efficient’ and more ‘holistic’ in many ways. For what it’s worth, I’m more of an ‘adapter’ with withdrawal tendencies than a ‘smasher’… rather than assert that any one ‘way’ has the right to remain unquestionably unchanged, I prefer to play with the deeper questions about society that new methods provoke. Perhaps that’s a snobbish reluctance to get my hands dirty – perhaps I’m just more of an introvert? She’s also right – in many ways, I am “probing the idea that sign language interpreting qualifies as a special case in comparison to all the other previous cases of skill based technological change in that the relationship between signers and interpreters can be contentious”. Interestingly, it’s not a need that is automatically between ‘signers and interpreters’ – the first case I can find in the historical record of an interpreter being needed wasn’t to help a signer (who was quite happy to write messages) – it was to help the non-signing hearing people who were illiterate and so couldn’t read the message! But, yes – it appears that there is a direct ‘need’ relationship embedded in the interpreter/client relationship. And given that Oralism, after all, was/is less about things ‘oral’ than it was/is about the discourses of control and capability that are woven around the Deaf community, the relationship of ‘need’, causes me all kinds of questions. And all of this is why, I think it’s fair to ask the question about Oralism and Interpreting… not because interpreters are a ‘problem’… rather, they are the best place to start, for three main reasons. Interpreters are one of the professions working in a ‘need’ dynamic with the Deaf community… and so will be impacted by the type of technology that an SL translation app (sorry for my unashamed use of the shortening *wink*) offers… So discussing the impact that technology like that might have is a way of exploring the larger social questions that MB outlines in her post. Interpreters generally do have the level of reflexivity that MB (and Austin’s paper) demonstrate. They see, and tread, the line between empowering and disempowering ‘need’ on a daily basis. So discussing this with them is immediately meaningful in a way that it might not be for, say, a more ‘unthinking’ Deaf-related industry – like audiology. Interpreters are, almost all, deeply knowledgeable about the Deaf community and deeply committed to the community as people – and to the community’s empowerment. At the same time, they juggle with their own jobs and responsibilities. So, ultimately, they’re going to be looking to resolve questions like these in ways that are empowering to both sides. I can’t think of a better place to start a discussion about something as emotive and as historically difficult as Oralism. Much of my work hinges on explorations of possibility, tied to imagined realities – so I wonder if it’s possible to run a thought experiment, and imagine that the SL translation App does actually work – and think about what might happen next *grins*. Excellent post, Mike. 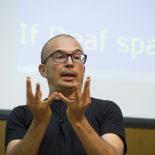 Yes, my talk was a first stab at trying to analyze how theories about culture (in general) have been used to explain Deaf culture (in particular) to hearing people, and especially to interpreter training students. So not only do interpreters risk being, lets say, out of date with cultural theory. But they risk going down a road of cultural essentialism, whose genealogy is colonial to begin with. (See Qadri Ishmael’s new book which will be released in a few months.) That’s not to say that we should throw out Cokely and Mindess, but we should point out that they use a particular theoretical lens to view culture. And frankly, I’m not comfortable with it. I think Ladd has some good comments in Deafhood about being skeptical of post-modern theory, but I would have liked him to spend a bit more time on it. To put it collegially, I think he runs a bit loose over what he calls post-modernism. I’d love to have a longer chat over this topic with you and Mary Beth. This entry was posted on March 15, 2012 by Mike Gulliver in Musings and tagged attitude, Interpreters, machine translation, Oralism, Sign Language Translation.